We have also noted the same trend in our practices as well. We are seeing more patients with facial swelling and major infections due to neglect or delay in seeking treatment. This is why it is so critical for patients to listen to their dentists when to addressing infected teeth, fractures, impacted third molars and so on. Dentists will typically see a patient on an every 6 month basis and have a better handle on the overall state of one’s oral cavity and dentition. For instance, if impacted third molars or other infected teeth are noted, they usually “refer” the patient to an oral surgeon for treatment. Unfortunately, some patients may delay and ignore the “referral” and not seek treatment in a timely fashion. They may wait until it becomes painful and or unmanagable. In general the longer an infection lingers, the more damage to the body and the surrounding tissue and the more the cost to the patient and the healthcare system. This is the whole premise and push behind becoming more “preventative” when it come to treating health problems, i.e. impacted third molars. It would help all of us and the healthcare system if we become “preventative” instead of “reactive” and waiting until the last minute to treat an infection or facial swelling. 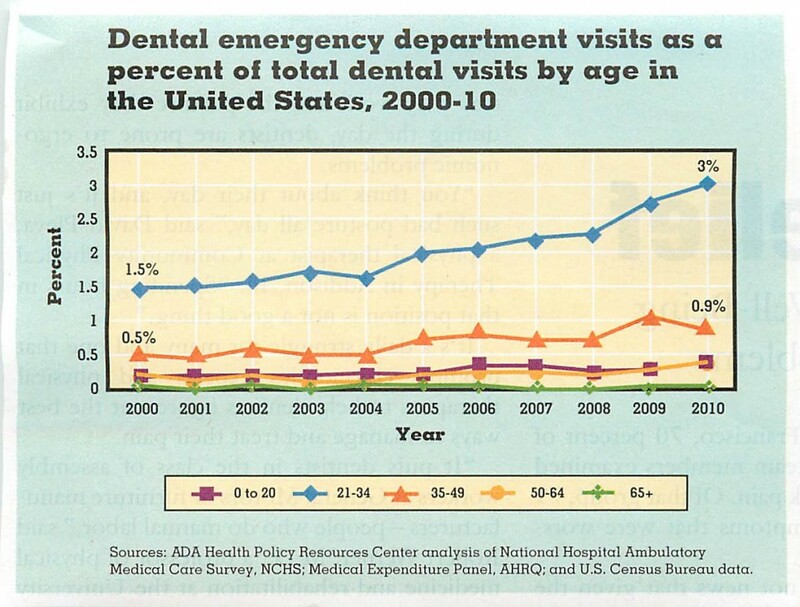 If you look at the chart below from the same article, you will note the largest increase of patients to the ER was between the ages of 21-34, around the same age that most people start having issues with their third molars. Please do yourself a favor and get your infected and impacted third molar treated before you have to head to the ER.